Enjoy one of our favorite books with us and a themed nature activity afterward! FREE for children of all ages with their favorite available adult. February 15 10-11am: For the Love of Bluebirds Reading: A Nest of Bluebirds by Rose Marie Botts Scott & Bluebird by Lindsay Yankey Followed by: Exploring the Bluebird Trail! March 15 10-11a: Let’s Go Fly A Kite Reading: When the Wind Blows by Linda Booth Sweeney Followed by: Flying kites in the field! 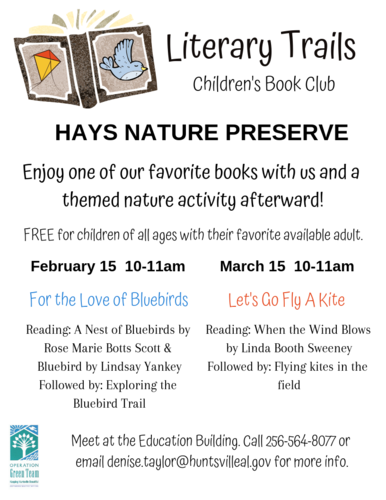 Meet at the Education Building near the entrance of Hays Nature Preserve for story time. Call 256-564-8077 or email denise.taylor@huntsvilleal.gov for more info.